After working in commercial firms and moving to Colorado to work in a residential firm for a few years, Dawn Sellars, owner of Aurora Design, returned to North Carolina in 1993. Originally from Charlotte, and with many family members in the NC mountains, she and her family chose to settle in Banner Elk; a place she had visited many times during her childhood. The High Country area of western North Carolina offered a similar mountain landscape to that in Colorado, and the opportunity to start a small business. The high end residential work experience she gained in Colorado proved invaluable when she began her architectural business, concentrating on custom designed homes. 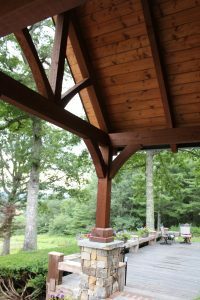 Aurora Design's home based office is in the heart of Banner Elk and this location is advantageous both professionally and personally. Centrally located to many resort areas and housing communities, it is only a short drive into Boone, Blowing Rock, and West Jefferson. This close community allows her to be involved in town and school activities, serve on community boards, and make a positive contribution to this beautiful area.